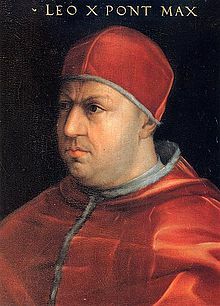 Accounts about the homosexual liaisons of Julius's successor, Leo X (Giovanni de' Medici, 1474-1521; reigned 1513-21), are recorded in a variety of different types of contemporary sources, and they were repeated in historical accounts of the papacy published in the later sixteenth century. Having received an outstanding humanistic education, he was appointed Cardinal in 1492 by Innocent VIII. Beginning in 1508, he served Julius II as papal legate; in that capacity, he arranged for papal troops to invade Florence in order to secure the return of the Medici, who had been exiled from the city in 1497. Unanimously elected Pope, Leo focused his energies upon the patronage of the arts and sciences. He established Greek colleges in Rome and Florence, promoted the study of Hebrew and Arabic writings, and gave strong support to printing. He funded extensive archaeological excavations, which uncovered the monumental antique statue of the river-god Nile (Vatican Museums) and other significant works, and he ordered the restoration of several important Early Christian churches, including Santa Maria Maggiore, Rome. To give the city of Rome a more dignified appearance, Leo widened the streets and restored several public squares, including the Piazza del Popolo. In Florence, he commissioned Michelangelo to design a new façade for San Lorenzo (project design, 1516-19; never realized) and to undertake one of his most significant projects--the building and decoration of the New Sacristy of San Lorenzo, including Medici family tombs (1519-34).